When does advertising become entertainment? Since inception Madison Avenue has played a game with the consumer. A game about turning items into desirable artefacts which we covet. Wherever there is a need, there will be a supplier, and where ever this relationship exists there will be an AdMan in between trying to make this relationship as profitable as possible both in terms of financial revenue and emotional desire. The future of advertising. 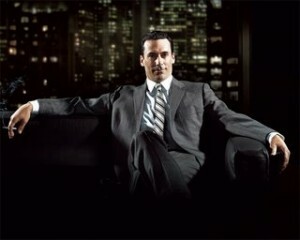 Don Draper. The evolution of connectivity has significantly marginalised the AdMan as the consumer becomes ever closer to the supplier. Where needing and having are almost instantaneous, there is little room for the AdMan to work – his job is to turn your need into desire into longing and at each stage he increases the value of the commodity in question. Once you are emotionally attached to a product and it begins to reflect back your life as you wish it were, it has a worth beyond its base purpose. We choose one soap over another because the AdMan has convinced us ‘this is the soap for you’. This can be about cost and availability, but is can equally be about lifestyle. The AdMan is a games designer, and evolving fields such as participatory advertising and alternate reality gaming may be something which is new to us as consumers, but represent the evolution of a skillset he has been honing for decades. My current PhD research proposal is around this subject and I will share it shortly.